Those who live in the DMV (DC, Maryland, Virginia) area will know the lure of chess in the parks. These places are known for their grittiness and hard-scrabble activities give a forum to many creative personalities… one of which is chess. 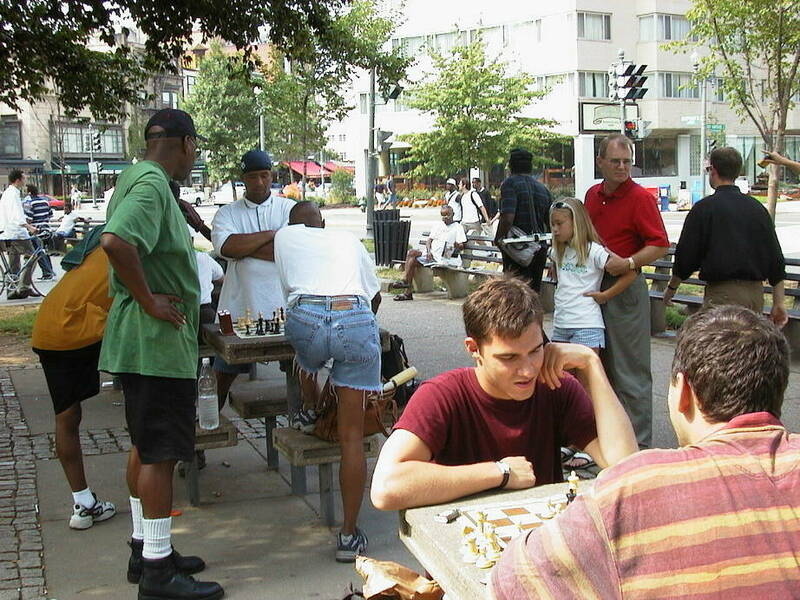 Washington, DC is known as the nation’s capitol, but for chess players, Dupont Circle is the watering hole for chess players. There have been a number of players who have passed through this park, but one of the names often mentioned is that of “Black Knight”. 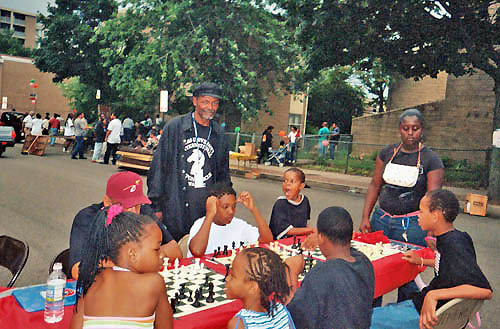 James “Black Knight” Taylor began playing chess during the turbulent 60s and adopted the nickname because none of the books he read as a teenager featured any Black players. Born in Roanoke, Virginia, but raised in Richmond, he started playing chess in the 60s before going on to serve in the Vietnam War and earning four Bronze Stars for valor. 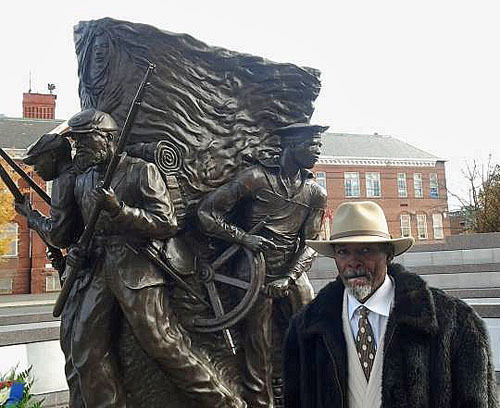 James “Black Knight” Taylor teaching his passion in the DC inner city. After returning to the U.S., he settled in Washington, DC in 1981 and with him he brought a love of chess. This is where he became the 1st Black player to win the DC Amateur Championship and where his legend was born. With this victory came a reputation that was honed in Dupont Circle, a famous park that attracts chess players… and hustlers. During this time, he set out on a mission… a mission to bring his love for chess to those who would not ordinarily have the interest or the confidence to learn the game. Taylor decided to share his passion for the game by opening up a “Chess University” to teach the game to children in impoverished areas. The scene at the famous Dupont Circle, Washington, DC. … with the irrepressible and legendary, Emory Tate! A face wizened with life’s battles, but impressed with his inward smiles, Taylor’s generosity was commended by Howard University and many players around him. “He didn’t get much help,” said his long-time friend Charles Smith. Smith, now in Alabama running “Magic City Chess”, glowed when speaking of Taylor and his Chess University project. The pride Taylor had in his Chess University was apparent and he came to the 2004 World Open with t-shirts. It is part of this altruism that warms the heart. When Tuduetso Sabure of Botswana became the first Black woman to earn the Women’s Grandmaster title, he began communicating with her, sending donations, books and other materials to Botswana to further her pursuits. Sabure no longer on the tournament circuit, but Taylor’s efforts were appreciated. 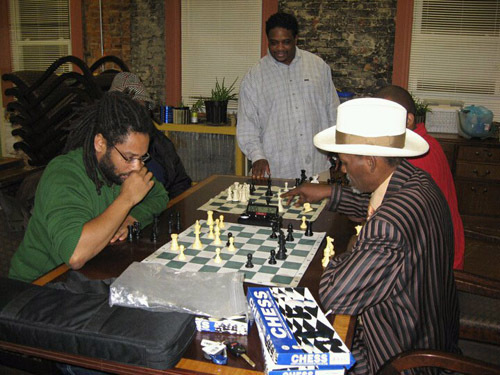 Black Knight wants to be remembered as one who gave for the advancement of chess in the Black community. He has lived through the struggles of being a “street master” in a literal sense when he trod on the hard-scrabble streets of DC trying to spread his knowledge of the game. Sometimes it was a lonely and thankless pursuit, but he soldiered on. Recently, Taylor has been suffering from failing health from the effects of terminal cancer. At the time of this writing he is at the McGuire Veteran’s Administration Medical Center in Richmond, Virginia ((804) 675-5000 ext. 6110) being treated, but the prognosis is grim. From henceforth, each day for him will be a blessing. While talking to him he asked me about the recent Tate-Ashley game and reminisced on old times. He also mentioned that he had never been the subject of an interview. Well… The Chess Drum was able to do an interview with Black Knight. Stay tuned! Nice Article Daaim! What did he ask u about the game? He asked me if I had seen the game. Not one of Maurice’s best games. I’ve included the link. Chris Torres said it is a Grand Prix Attack, but it transposed into a Sicilian Scheveningen. oh thanks , i thought he may have had some insights on the game, i see it now, yeah Rg8 not so hot. I remember him VERY well growing up in the chess scene down there, and am sad to hear of his condition. Just gave him a call and we reminisced a bit. He WILL be missed. A very nice article on a soldier for chess since the 60’s. The name Black Knight sound like a legend or a tactical chess player. 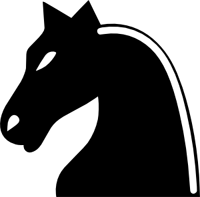 The Knight will destroy your whole kingdom with one powerful move. I also met a chess player at the Chicago Open and he was wearing a Black Night chess club shirt. I said that is a nice shirt. The guy gave me one the next day, I wore it all the time. Today I get to meet the real Black Night thanks to your article. There is a chess player in Orlando named Black Night. I wish you better days and lasting spirits. He’s given to a lot of independent causes. He gave a donation after my mother passed. I told him how I taught my mother to play chess and he was inspired by that story and gave a donation to promote a young sister. I gave it to Darrian Robinson and Medina Parrilla. I’m sending this email for my great niece Jaborah Crews , who is also James “Black Knight” Taylor’s granddaughter. Jaborah moved her grandfather to Richmond, VA to lived with her; after being here a month he was hospitalized VAMC until his death.She is asking for assistance in burying her grandfather. She can be contacted on facebook Jaborah Crews or call her at 804-258-3411 for more information. Dupont Circle back in the day . I let him know I really appreciated our chess relationship. Back in the 90’s I spent a month in DC on work detail and got chess lesson while meeting some of the regulars in DuPont Circle. Not sure if I met or observed Mr. Taylor but I am sure it would have been a pleasure. My skills as a 42 year old adult who was just getting into chess was comparable to a 1st grade but I got a real lesson in chess and life. There was one player (a minister/taxi driver) who took a personal interest in my dilemma. I wish I could recall his name and wonder if he is still a regular. He kept telling me I must learn the Grünfeld Defence. If someone knows him tell him the kid from California says hello and still does not know the Grunfeld but is the local chess club president! Black Knight is a great guy. Thank you for acknowledging his efforts. Hope those whom he had an acquaintance really continue to “be all they can be” because of his encouragement. We performed a “Dual Simul” together and I learned of his calmness, integrity and LOVE for others. Mr. Shabazz…David Sherman here. It’s Friday Aug 8 9 pm…Tell me please that it’s not too late to visit. I can go down tomorrow. I knew Knight was sick but no one let me know anything up here in DC. Dave it’s been to long. Thanks for caring. We spent many long days at the DuPont Circle and I have many fond memories of you,Knight, Lefty and the whole D.C. Chess scene back in the 90’s. Our friend is gone but oh what memories we still have. The most inspiring abvocate of chess I have ever meant. His inspiration led me to become a level IV chess coach. The Black Knight also inspired me to become the last African American Amature D.C. Champion. 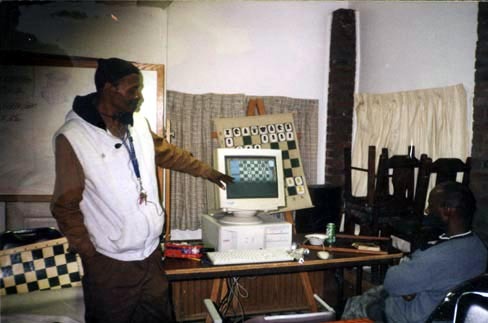 My friend James “BlackKnight” Taylor will always be remembered by me and now the chess playing community thanked to Dr. Shabazz and his chess drum. You are wonderful and this web site is where we all come home to. Thank you for what you did for James Black Knight Taylor and the chess community! You are love!! The chess village has lost a warrior. I mourn his passing. It is a loss of profound significance. 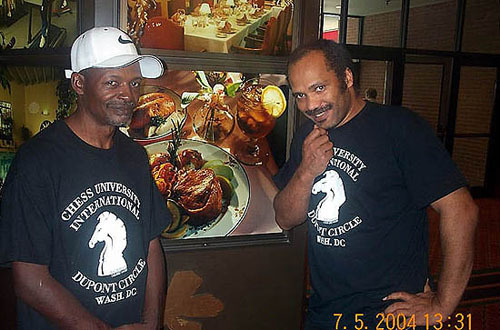 When I first started competing in chess in the early 1980s Knight was one of the first hustlers I came in contact with at DuPont Circle. What a pleasure treasure he was. Here’s to one of the best inspiring personalities in my life. James “Black Knight” Taylor was a true artist of the game; not just a hustler. His vision and wisdom will be well missed. As one of the rising talents in DuPont Circle until family life it’s toll; I always wanted to mimic his play; but was not quite able to reach those levels until my later years. But, when he was very active at the circle is when we would spend countless hours playing blitz and going over famous games; especially with the legendary Emory Tate. The fellowship and the knowledge sharing was vey beneficial. My Condolences, he will be well missed.